The Right to Information Act, 2005 empowers citizens to get information from any 'public authority'. The Central Public Information Officer (CPIO) of a public authority plays a pivotal role in making the right of a citizen to information a reality. The Act casts specific duties on him and makes him liable for penalty in case of default. It is, therefore, essential for a CPIO to study the Act carefully and understand its provisions correctly. Following aspects should particularly be kept in view while dealing with the applications under the Act. Information means any material in any from. It includes records, documents, memos, e-mails, opinions, advices, press releases, circulars, orders, logbooks, contracts, reports, papers, samples, models, data material held in any electronic from. It also includes information relating to any private body which can be accessed by the public authority under any law for the time being in force. A citizen has the right to seek such information from the public authority, which is held by the public authority or which is held under its control. This right includes inspection of work, documents and records; taking notes, extracts or certified copies of documents or records; and taking certified samples of material held by the public authority or held under the control of the public authority. The Act gives the citizens a right to information at par with the Members of Parliament and the Members of States Legislatures. According to the Act, the information which cannot be denied to the Parliament or a State Legislature, shall not be denied to any person. A citizen has the right to obtain an information in the from of diskettes, floppies, tapes, video cassettes or in any other electronic mode or though print-outs, provided such information is already stored in a computer or in any other device from which the information may be transferred to diskettes etc. The information should ordinarily be provided in the from in which it is sought by an applicant. However, if the supply of information sought in a particular from would disproportionately divert the resources of the public authority or may cause harm to the safety or preservation of the records, supply of information in that form may be denied. The Act gives the right to information only to the citizen of India. It dose not make provision for giving information to Corporations, Associations, Companies etc. which are legal entities/persons, but not citizens. However, if an application is made by employee or office-bearer of any Corporation, Association, Company, NGO etc. indicating his name and such employee/office bearer is a citizen of India, information may be supplied to him/her. In such cases, it would be presumed that a citizen has sought information at the address of the Corporation etc. Only such information is required to be supplied under the Act which already exists and is held by the public authority or held under the control of the public authority. The CPIO is not supposed to create information; or to interpret information; or to solve the problems raised by the applicants; or to furnish replies to hypothetical questions. Sub-section (1) of section 8 and section 9 of the Act enumerate the types of information which is exempt from disclosure. Sub-section (2) of section 8, however, provides that information exempted under sub-section (1) or exempted under the Official Secrets Act, 1923 can be disclosed if public interest in disclosure overweighs the harm to the protected interest. Further, sub-section (3) of section 8 provides that information exempt from disclosure under sub-section (1), except as provided in clauses (a), © and (i) thereof, would cease to be exempted after 20 years from the date of occurrence of the related event etc. cabinet papers including records of deliberation of the Council of Ministers, Secretaries and other Officers subject to the conditions given in proviso to clause (i) of sub-section (1) of Section 8 of the Act. The RTI Act has over-riding effect vis-a-vis other laws inasmuch as the provisions of the RTI would have effect notwithstanding anything inconsistent therewith contained in the Official Secrets Act, 1923, and any other law for the time being in force or in any instrument having effect by virtue of any law other than the RTI Act. The Central Public Information Officer has a duty to render reasonable assistance to the persons seeking information. As per provisions of the Act, a person, who desires to obtain any information is required to make a request in writing or through electronic means in English or Hindi or in the official language of the area in which the application is made. If a person seeking information is not able to make such request in writing, the Central Public Information Officer should render reasonable assistance to him to reduce the same in writing. Where access to a record is required to be provided to a sensorily disabled person, the Central Public Information Officer should provide assistance to such person to enable him to access the information. He should also provide such assistance to the person as may be appropriate for the inspection of records where such inspection is involved. The Central Public Information Officer may seek the assistance of any other officer as he or she considers necessary for the proper discharge of his or her duties. The officer, whose assistance is so sought by the CPIO, would render all assistance to him. Such an officer shall be deemed to be a Central Public Information Officer and would be liable for contravention of any provisions of the Act, the same way as any other Central Public Information Officer. It would be advisable for the CPIO to inform the officer whose assistance is sought, about the above provision, at the time of seeking his assistance. The Act makes it obligatory for every public authority to make suo motu disclosure in respect of the particulars of its organization, functions, duties and other matters, as provided in section 4 of the Act. The information so published, according to sub-section (4) of section 4, should be easily accessible with the CPIO in electronic format. The CPIO should, therefore, make concerted efforts to ensure that the requirements of Section 4 are met and maximum information in respect of the public authority is made available on the internet. It would help him in two ways. First, the number of applications under the Act would be reduced and secondly, it would facilitate his work of providing information inasmuch as most of the information would be available to him at one place. An applicant, along with his application, is required to send a demand draft or a banker's cheque or an Indian Postal Order of Rs.10/- (Rupees ten), payable to the Accounts Officer of the public authority as fee prescribed for seeking information. He can also make payment of fee by way of cash to the Accounts Officer of the public authority or to the Central Assistant Public Information Officer against proper receipt. for information provided in printed from at the price fixed for such publication or rupees two per page of photocopy for extracts from the publication. If the applicant belongs to below poverty line (BPL) category, he is not required to pay any fee. However, he should submit a proof in support of his claim to belong to the below poverty line. The application not accompanied by the prescribed fee of Rs.10/- or proof of the applicant's belonging to below poverty line, as the case may be, shall not be a valid application under the Act and, therefore, dose not entitle the applicant to get information. An applicant making request for information is not required to give any reason for requesting the information or any other personal details except those that may be necessary for contacting him. Also, the Act or the Rules do not prescribe any format of application for seeking information. Therefore, the applicant should not be asked to give justification for seeking information or to give details of his job etc. or to submit application in any particular form. Soon after receiving the application, the CPIO should check whether the applicant has made the payment of application fee of Rs. 10 or whether the applicant is a person belonging to a Below Poverty Line (BPL) family. If application is not accompanied by the prescribed fee or the BPL Certificate, it cannot be treated as a valid application under the RTI Act and may be ignored. If the application is accompanied by the prescribed fee or the Below Poverty Line Certificate, the CPIO should check whether the subject matter of the application or a part thereof concerns some other public authority. If the subject matter of the application concerns any other public authority, it should be transferred to that public authority. If only a part of the application concerns the other Public authority, a copy of the application may be sent to that public authority, clearly specifying the part which relates to that public authority. While transferring the application or sending a copy thereof, the concerned public authority should be informed that the application fee has been received. The applicant should also be informed about the transfer of his application and the particulars of the public authority to whom the application or a copy thereof has been sent. Transfer of application or part thereof, as the case may be, should be made as soon as possible and in any case within five days from the date of receipt of the application. 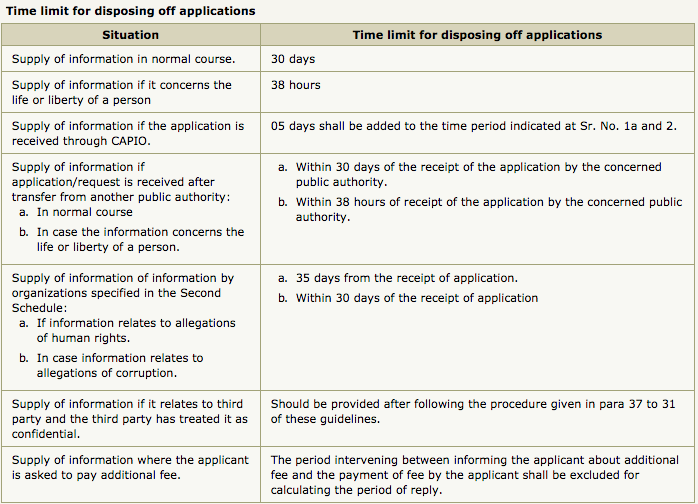 If a CPIO transfers an application after five days from the receipt of the application, he would be responsible for delay in disposing of the application to the extent of number of days which he takes in transferring the application beyond 5 days. The CPIO of the public authority to whom the application is transferred, should not refuse acceptance of transfer of the application on the ground that it was not transferred to him within 5 days. A public authority may designate as many CPIOs for it, as may deem necessary. It is possible that in a public authority with more than one CPIO, an application is received by the CPIO other than the concerned CPIO. In such a case, the CPIO receiving the application should transfer it to the concerned CPIO immediately, preferable the same day. Time period of five days for transfer of the application applies only when the application is transferred from one public authority to another public authority and not for transfer from one CPIO to another in the same public authority. The answering CPIO should check whether the information sought or a part thereof is exempt from disclosure under section 8 or Section 9 of the Act. Request in respect of the part of the application which is so exempt may be rejected and rest of the information should be provided immediately or after receipt of additional fees, as the case may be. the particulars of the authority to whom an appeal can be made. The time limit within which the appeal can be made. Where a request is received for access to information which is exempt from disclosure but a part of which is not exempt and such part can be severed in such a way that the severed part does not contain exempt information then, access to that part of the information/record may be provided to the applicant. Where access is granted to a part of the record in such a way, the Central Public Information Officer should inform the applicant that the information asked for is exempt from disclosure and that only part of the record is being provided, after severance, which is not exempt from disclosure. While doing so, he should give the reasons for the decision, including any findings on any material question of fact, referring to the material on which those findings were based. The CPIO should take the approval of appropriate authority before supply of information in such a case and should inform the name and designation of the person giving the decision to the applicant also. The CPIO should supply the information within thirty days of the receipt of the request. Where the information sought for concerns the life or liberty of a person, the same should be provided within forty-eight hours of the receipt of the request. Every Public authority is required to designate an officer at each sub-divisional level or other sub-district level as a Central Assistant Public Information Officer (CPAIO) to receive the applications or appeals under the Act for forwarding the same to the Central Public Information Officer or the first Appellate Authority or the Central Information Commission. If request for information is received through the CAPIO, the information may be provided within 35 days of receipt of application by the CAPIO in normal course and 48 hours plus 5 days in case the information sought concerns the life or liberty of a person. In case of an application transferred from one public authority to another public authority, as referred to in para 21, reply should be provided by the concerned public authority within 30 days of the receipt of the application by that public authority in normal course and within 48 hours in case the information sought concerns the life or liberty of a person. The Central Public Information Officers of the intelligence and security organizations specified in the Second Schedule of the Act may receive applications seeking information pertaining to allegations of corruption and human rights violations. Information in respect of allegations of violation of human rights, which is provided only after the approval of the Central Information Commission, should be provided within forty-five days from the date of the receipt of request. Time limit prescribed for supplying information in regard to allegations of corruption is the same as in other cases. (a) within 30 days of receipt of application by concerned public authority. (b) within 48 hours of receipt of application by concerned public authority. (a) if information relates to allegations of violation of human rights. (b) In case information relates to allegations of corruption. (a) Within 30 days of the receipt of application by concerned public authority. (b) Within 48 hours of receipt of the application by concerned public authority. 6. Supply of information if it relates to third party and the third party has treated it as confidential. Should be provided after following the procedure given in para 37 to 41 of these guidelines. If the CPIO fails to give decision on the request for information within the prescribed period, the Central Public Information Officer shall be deemed to have refused the request. It is pertinent to note that if a public authority fails to comply with the specified time limit, the information to the concerned applicant would have to be provided free of charge. Third party in relation to the Act means a person other than the citizen who has made request for information. Any public authority other than the public authority to whom the request has been made shall also be included in the definition of third party. It may be noted that information including commercial confidence, trade secrets or intellectual property, the disclosure of which would harm the competitive position of a third party, is exempt from disclosure. Section 8(1) (d) requires that such information should not be disclosed unless the competent authority is satisfied that larger public interest warrants the disclosure of such information. If an applicant seeks any information which relates to or has been supplied by a third party and that third party has treated that information as confidential, the Central Public Information Officer should consider whether the information should be disclosed or not. The guiding principal in such cases should be that except in the case of trade or commercial secrets protected by law, disclosure may be allowed if the public interest in disclosure outweighs in importance any possible harm or injury to the interests of such third party. However, procedure as given below should be followed before disclosing such information. It may be noted that procedure need be followed only when the third party has treated the information as confidential. If the CPIO intends to disclose the information, he should within five days from the receipt of the application, give a written notice to the third party that the information has been sought by the applicant under the RTI Act and that he intends to disclose the information. He should request the third party to make a submission in writing or orally, regarding whether the information should be disclosed. The third party should be given a time of ten days, from the date of receipt of the notice by him, to make representation against the proposed disclosure, if any. The Central Public Information Officer should make a decision regarding disclosure of information keeping in view the submission of the third party. Such a decision should be taken within forty days from the receipt of the request for information. After taking the decision, the CPIO should give a notice of his decision to the third party in writing. The Notice given to the third party should include a statement that the third party is entitled to prefer an appeal under section 19 against the decision. The third party can prefer an appeal to the First Appellate Authority against the decision made by the Central Public Information Officer within thirty days from the date of the receipt of notice. If not satisfied with the decision of the First Appellate Authority, the third party can prefer the second appeal to the Central Information Commission. If an appeal has been filed by the third party against the decision of the CPIO to disclose the third party information, the information should not be disclosed till appeal is decided. If an applicant is not supplied information within the prescribed time limit, or is not satisfied with the information furnished to him, he may prefer an appeal to the first appellate authority who is an officer senior in rank to the CPIO. Such an appeal can be made within a period of 30 days from the date on which time limit for apply of information expires or the decision of the CPIO is received. The appellate authority of the public authority is expected to dispose of the appeal within a period of thirty days or in exceptional cases within 45 days of the receipt of the appeal. If the first appellate authority fails to pass an order on the appeal within the prescribed period or if the appellant is not satisfied with the order of the first appellate authority, he may prefer a second appeal with the Central Information Commission within ninety days from the date on which the decision should have been made by the first appellate authority or was actually received by the appellant. If any person is unable to submit a request to a Central Public Information Officer either by reason that such an officer has not been appointed by the concerned public authority; or the Central Assistant Public Information Officer has refused to accept his or her application or appeal for forwarding the same to the Central Public Information Officer or the appellate authority, as the case may be; or he has been refused access to any information requested by him under the RTI Act; or he has not been given a response to a request for information within the time limit specified in the Act; or he has been required to pay an amount of fee which he considers unreasonable; or he believes that he has been given incomplete, misleading or false information, he can make a complaint to the Central Information Commission. As pointed out above, an applicant under the Act has a right to appeal to the Central Information Commission and also to make complaint to the Commission. Where the Central Information Commission at the time of deciding any complaint or appeal is of the opinion that the Central Public Information Officer has without any reasonable cause, refused to receive an application for information or has not furnished information within the time specified or malafidely denied the request for information or knowingly given incorrect, incomplete or misleading information or destroyed information which was the subject of the request or obstructed in any manner in furnishing the information, it shall impose a penalty of two hundred and fifty rupees each day till application is received or information is furnished subject to the condition that the total amount of such penalty shall not exceed twenty-five thousand rupees. The Central Public Information Officer shall, however, be given a reasonable opportunity of being heard before any penalty is imposed on him. The burden of proving that he acted reasonably and diligently and in case of denial of a request that such denial was justified shall be on the Central Public Information Officer. Where the Central Information Commission at the time of deciding any complaint or appeal is of the opinion that the Central Public Information Officer has without any reasonable cause and persistently, failed to receive an application for information or has not furnished information within the time specified or malafidely denied the request for information or knowingly given incorrect, incomplete or misleading information or destroyed information which was the subject of the request or obstructed in any manner in furnishing the information, it may recommend for disciplinary action against the Central Public Information Officer. Section 21 of the Act provides that no suit, prosecution or other legal proceeding shall lie against any person for anything which is in good faith done or intended to be done under the Act or any rule made thereunder. A CPIO should, however, note that it would be his responsibility to prove that his action was in good faith. Department of Personnel & Training has issued Format for giving information to the applicants under RTI Act. RTI application number, date and date of its receipt in the public authority. The name, designation, official telephone number and email ID of the CPIO. In case the information requested for is denied, detailed reasons for denial quoting the relevant sections of the RTI Act should be clearly mentioned. In case the information pertains to other public authority and the application is transferred under section 6(3) of the RTI Act, details of the public authority to whom the application is transferred should be given. In the concluding para of the reply, it should be clearly mentioned that the First Appeal, if any, against the reply of the CPIO may be made to the First Appellate Authority within 30 days of receipt of reply of CPIO. The name, designation, address, official telephone number and e-mail ID of the First Appellate Authority should also be clearly mentioned. True copy of the document/record supplied under RTI Act. Created by shrawan on 2015/07/25 05:17.